Does Santana get the Led out on his new album? Describing Led Zeppelin's Whole Lotta Love, Carlos Santana said that the song "has a hard edge, like hip-hip from the ghetto." The guitarist, who covered the epochal track, among others, on his new album, Guitar Heaven: The Greatest Guitar Classics Of All Time, waxed effusive about his collaboration with singer Chris Cornell on the beloved Zep cut. Saying that Cornell "nailed" the song "like a surfer [who] rides the wave of the band," Santana told ExploreMusic's Jeff Woods that the Soundgarden vocalist wasn't exactly his first choice: "[Cornell] had to come up and do that energy, because I purposely wanted Tupac Shakur - if he was here - or Nas to do that song. It's a wonderful way to start the CD because it has a very effervescent energy." Nas does appear, however, on a reworking of AC/DC's hallowed Back In Black. 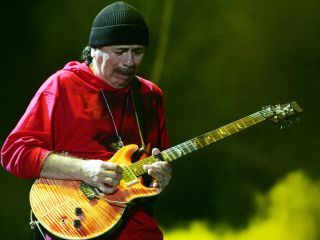 "It's one of my favorite songs," Santana said, "in a sense that when I play it, it reminds me of what it's like to be a 14-year-old with a lot of pimples, which means testosterone, and you're not afraid. You're not looking for approval. You're just gonna do it no matter what. It's that energy that I wanted, and Nas just nailed it." The album, which follows the same principle of the guitarist's 1999 smash Supernatural (different guest vocalists for each song), finds Santana teaming up again with his Smooth cohort Rob Thomas for a cover of Cream's Sunshine Of Your Love. "When we did Sunshine Of Your Love, I was able to open it up for the drums, timbales and congas," Santana explained. "It's that hole that we leave open where it gets very sensual and euphoric, and Rob picked up on it." So what do you think so far? Are Santana's covers rockin'? Let us know!